Young anglers with Jeff Morris catch and release a nice spring fish. MIRAMICHI – There is a mixed report this week, with still some spring salmon around, a few trout starting and an increase in striped bass numbers. The water has dropped nicely and has cleared from last week’s deluge. Lakes and ponds in NB are now officially open for angling. W. W. Doak and Sons in Doaktown said angling had improved over last week as the river had settled as water cleared and dropped. There were not a lot of anglers out, but those who were, were getting into fish. With the water staying cool, there were still spring salmon around, even as far up as Ludlow. Catches were a mix, with more salmon than grilse. They expected to see the annual sea trout run any time in the next two weeks, so anglers should be out and checking. Only the odd trout was reported yet. Flies of choice were Grey Ghosts, Smelts, Christmas Trees and Marabous. Andrew Anthony of Ledges Inn in Doaktown and Mountain Channel in the Rapids area said the water was down and had cleared. Fishing was still good on Saturday when one angler caught five salmon and three grilse. A few trout were reported, but nothing of significant size or numbers. There were a few fiddleheads starting to appear. Flies of choice were darker flies such as Marabous for clear water. Herb Barry Sr. of Herb’s Fly Shop on the Station Road in Blackville said there was not much to report as it was quiet with very few anglers out. 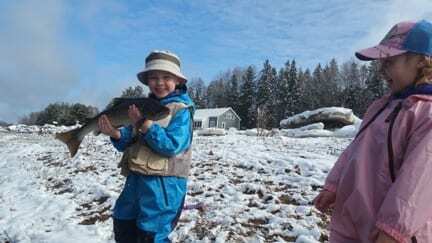 They had seen a salmon jump on Saturday in the Upper Blackville area. There were reports of some black trout in the Quarryville area. They were catching a few striped bass in the City of Miramichi area. Flies of choice were Grey Ghosts, Black Ghosts and Green Ghosts. The regular spring flies for salmon were pretty well done, but were being tied and used in smaller versions for trout. Curtis Miramichi River Outfitting in Blackville said there were a few spring salmon still around, but not many anglers out to catch them. The water was dropping and had cleared. There was an unconfirmed report of a bright salmon. Flies of choice were Blue Smelts, Black Ghosts, Renous Specials and Marabous such as the Green Slime. Jim Laws of Miramichi Hunting and Fishing in Newcastle, Miramichi said there were no reports of spring salmon, but the numbers of stripers was increasing along the river. Fishing for them seemed better by boat as the shores were still a bit dirty with a lot of debris. There were a few big trout reported. 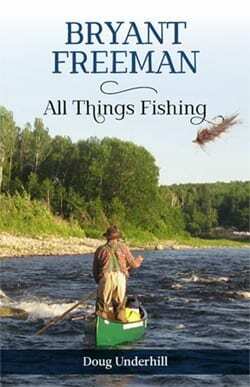 Flies of choice were Black Ghosts and Mickey Finns for trout and rubber fish and bait on a circle hook for bass. Syd Matchett of Trout Brook Fly Shop on the Northwest Miramichi said the Northwest was quiet as far as spring salmon was concerned, but they were catching some nice trout. One angler had a couple in the 2-3 pounds, while others had a 4 ½ and 5 ½ pounders. There were still lots of smelts in. Striped bass had picked up in Loggieville. The annual Red Bank Trout Derby is this weekend. Flies of choice were Renous Specials, Black Ghosts, Silver Smelts and Mickey Finns for both trout and the last of the spring salmon. Debbie Norton of Upper Oxbow Outdoor Adventures on the Little Southwest Miramichi said there were still a few spring salmon around as they had caught a salmon and a grilse on the weekend. The smolt wheels are in, and they even picked up two grilse making their way out. They are tagging some of the smolt from the wheel with something new called “Predator Tags” which will vary their frequency signal if the smolt ends up in the belly of a larger fish. It is activated by the stomach acid of the predator and changes the sound of the tracking beep. Striped bass fishing had improved. “But it is too bad DFO is going to close a good portion of the spawning area without good science to base the decision on”, said Norton. Water levels are where they should be for this time of year. There were a few trout reports, but nothing of significance. Norton has been appointed as a new ASF Director. Flies of choice were Renous Specials, Black Ghosts and Mickey Finns. So as we approach a long weekend, take some time to get out and “on the water”. The Coalition for Better Salmon Management (CBSM) now has a website at salmonnb.com, which already has a membership over 1,000. It is a major voice for salmon conservation here in New Brunswick. Check “Miramichi Striper Cup 2017” for this year’s Striped Bass tournament coming up May 25 weekend. There is on-line registration. This is a syndicated post. You can view the original post here: Miramichi Fishing Report for Thursday, May 18, 2017.